In the winter of 1952, New England was battered by the most brutal nor'easter in years. As the weather wreaked havoc on land, the freezing Atlantic became a wind-whipped zone of peril, setting the stage for one of the most heroic rescue stories ever lived. On February 18, while the storm raged, two oil tankers, the Pendleton and the Fort Mercer, were in the same horrifying predicament. Built with "dirty steel," and not prepared to withstand such ferocious seas, both tankers split in two, leaving the dozens of men on board utterly at the Atlantic's mercy. 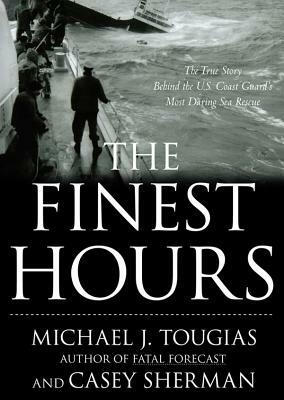 The Finest Hours is the gripping, true story of the valiant attempt to rescue the souls huddling inside the broken halves of the two ships. The spellbinding tale is overflowing with breathtaking scenes, as boats capsize, bows and sterns crash into one another, and men hurl themselves into the raging sea in a terrifying battle for survival. Not all of the eighty-four men caught at sea in the midst of that brutal storm survived, but considering the odds, it's a miracle--and a testament to their bravery--that any at all came home to tell their tales.